Hi friends! Today is the fourth day of our Holiday Craftacular Blog Hop and Linky Party. 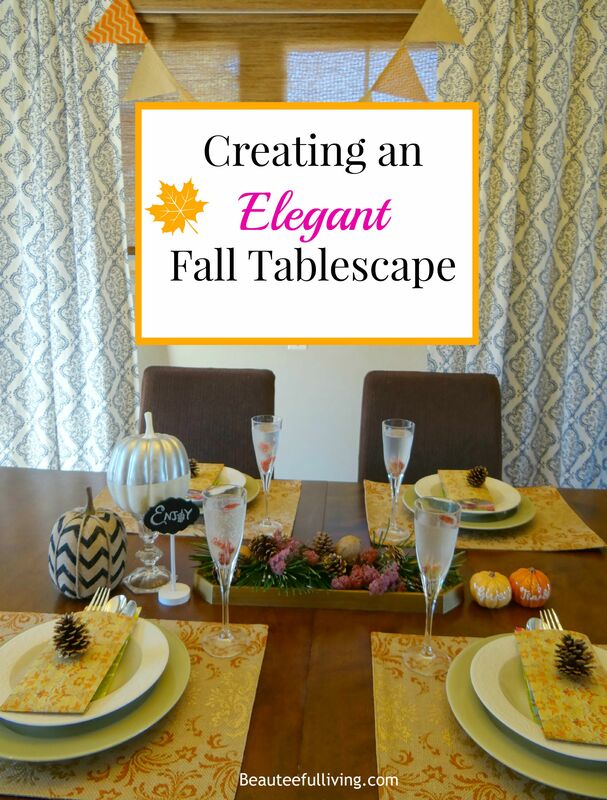 I’m very excited to be sharing an elegant tablescape I created for the fall season. 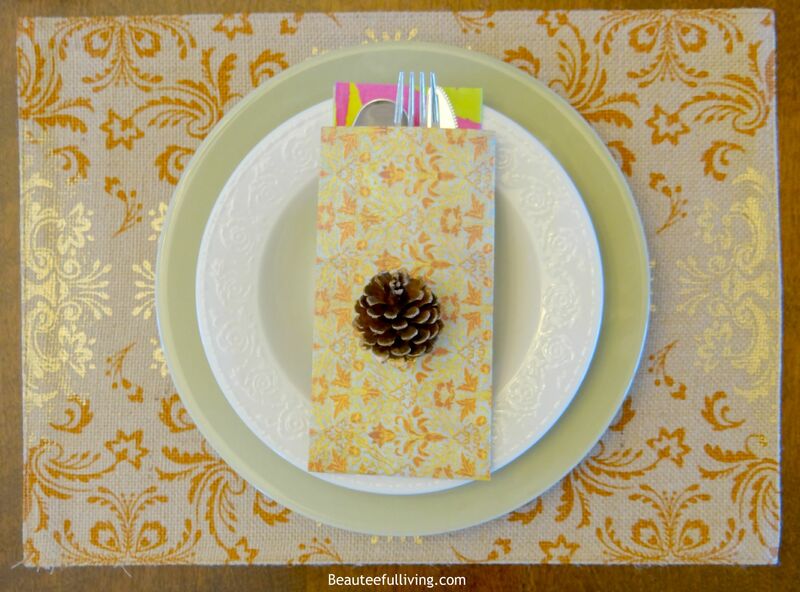 I’m listing the elements that made my fall tablescape complete in these simple steps. 1) Pennant Banner – I purchased this banner from Target a couple of weeks ago. While the banner was cute, it needed a little something. I decided that adding some letters to spell out “fall” would do the trick! 2) Centerpiece – I clipped branches from our pine tree for this display. 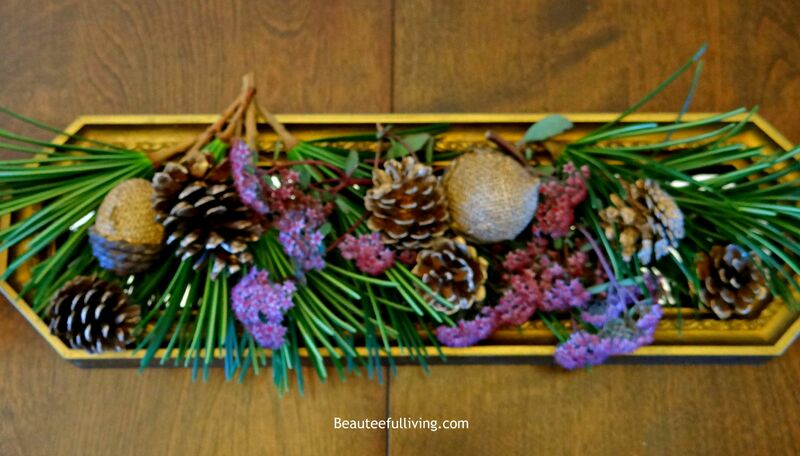 Love how the green clippings look against the gold painted acorns and pine cones. 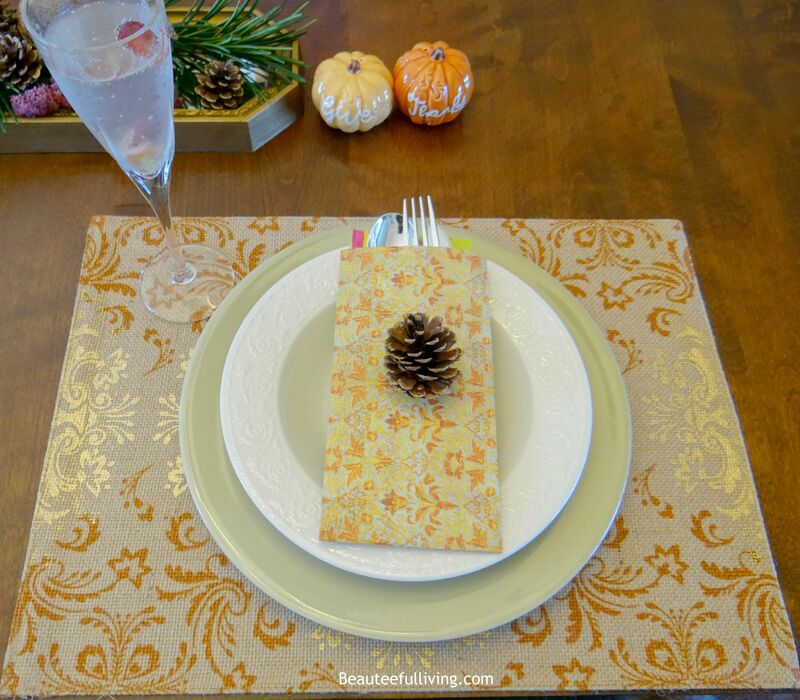 3) Table Setting – When I saw these place mats from Kohl’s, I knew I had to have them. The damask print was exactly the elegant look I was after! For the plate and salad bowl, I simply chose 2 different colors for some contrast. 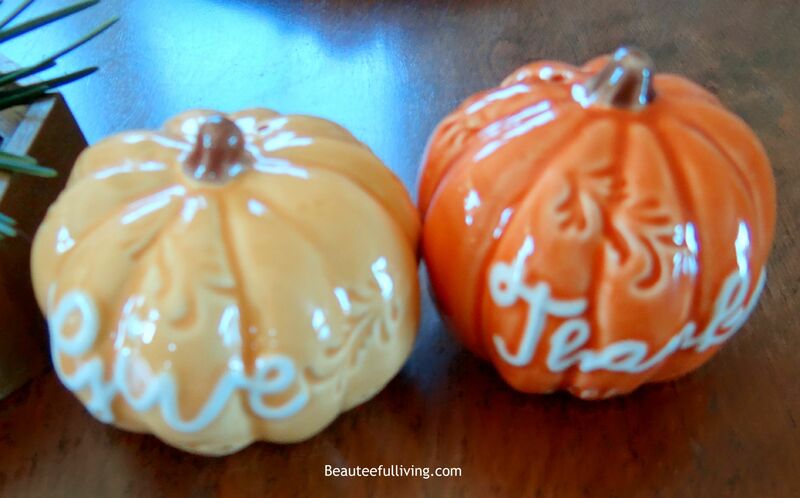 4) Salt and Pepper Shakers – Not only will salt and pepper come in handy for meals, they also spell out “give thanks.” Love it! You can purchase them from Kohls. 5) Drinking Glasses – I love champagne but it was definitely too early in the day for me to enjoy a glass when these photos were taken. 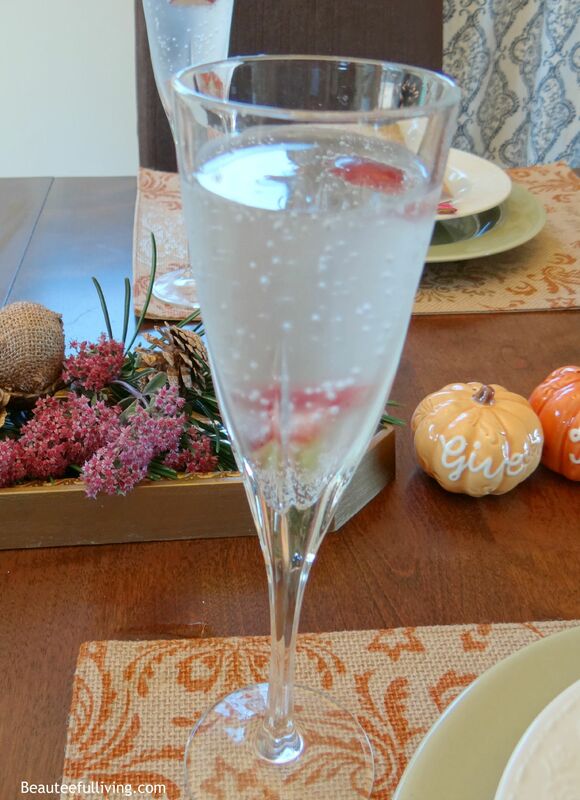 Instead, I poured sparkling water into these flutes and sprinkled some sliced grapes for added fun. 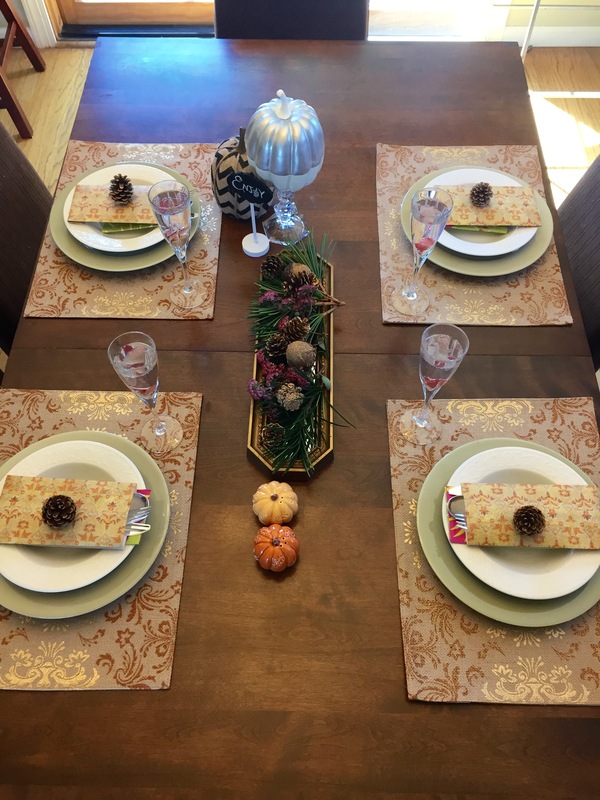 6) Ready for a Close Up – The table setting is complete! 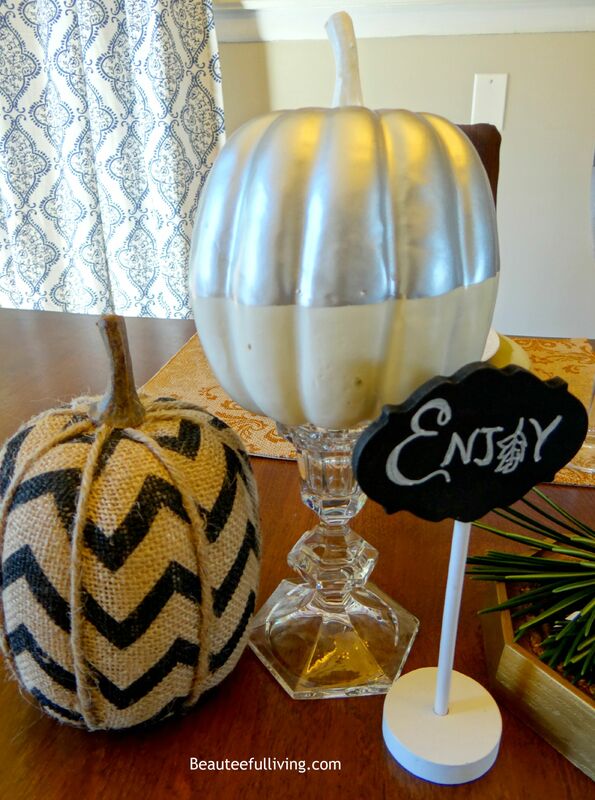 7) Decorative Details – Pumpkins are always great for fall but when they are chic and glam…even BETTER! 🙂 By the way, they were only $3.00 each from Target (Dollar Spot aisle). 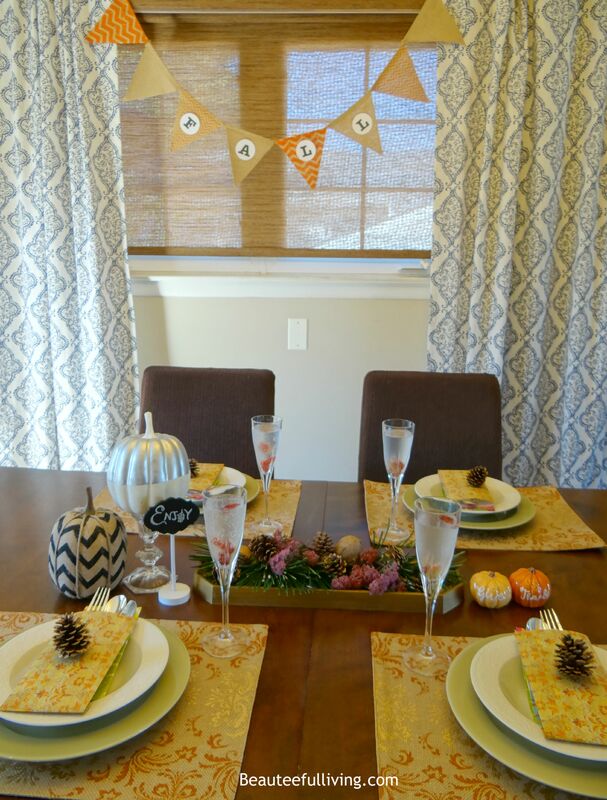 My elegant-themed fall tablescape is all ready for dinner guests! Here’s a view from above! Can’t forget the fall pennant banner in the background. I hope you’ve enjoyed this little tour of the elegant tablescape I created for fall. Please bookmark or pin this post for future reference. Thanks! By the way, if you’re a fellow blogger, we’d love for you to share your fall project, recipe or craft at the Holiday Craftacular linky party below! We’re very excited to see your fall creations! Please be sure to follow your Holiday Craftacular hosts if you link up. We’ll share our linky party favorites at our next Holiday Craftacular blog hop and on our Holiday Craftacular Pinterest Board. Have a question or comment about this elegant-themed fall tablescape? I’d love to hear from you. Xo, Tee. 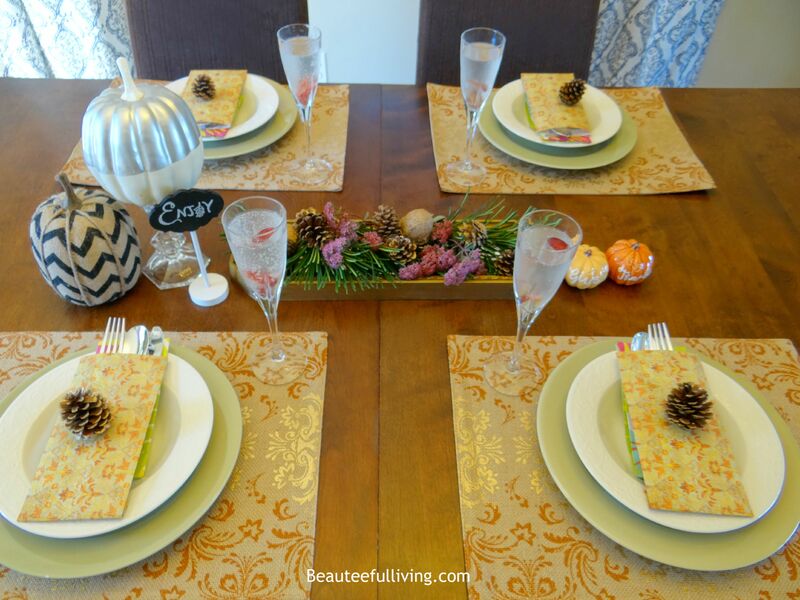 The Fall tablescape is so beautiful! You are so creative. I would like to try something like this. This table is so pretty! I really wish we had a dining room, I would glam it up for every holiday! It was so creative of you to add the word Fall to the Target banner and I love how you decorated the pumpkins with fall words, too! Having fun doing this holiday blog hop with you, Tee! Thanks so much, Carrie! This has been such a fun holiday blog hop. Look forward to the next one! I am in love with those salt and pepper shakers! I will be looking for those for sure! Pretty and simple. Everything compliments each other very well. Good job, Tee! Oh the whole design is just so beautiful. Every little detail contributes to it even the adorable salt and pepper shakers! The plating is so gorgeous as well. Just lovely! I really miss Target here in Canada. They had GREAT design items!! Your table looks gorgeous! Wish I had enough patience to try that. Very, very pretty! I made Apple Candle holders yesterday and I want to get some mini squash pumpkins and make some more. I love your table setting. Very pretty, I love the banner! Goodness! I need you around whenever I throw my next dinner party. 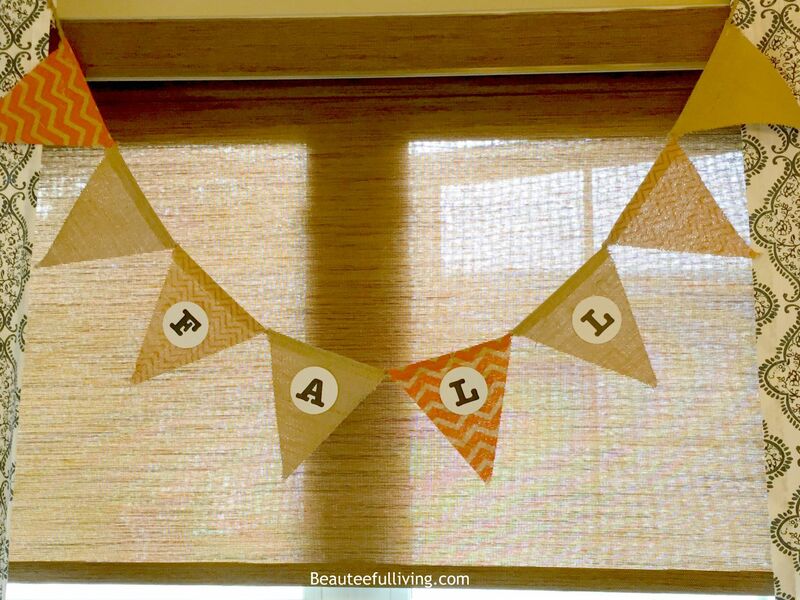 I simply love that banner and am making one this weekend for sure! Thanks so much for the compliment, Leilani! Have fun making your fall banner :). Hi, Tee! I love your pretty table! Using the card stock was a clever idea! Thanks, Lauren! I love using card stock whenever I can. 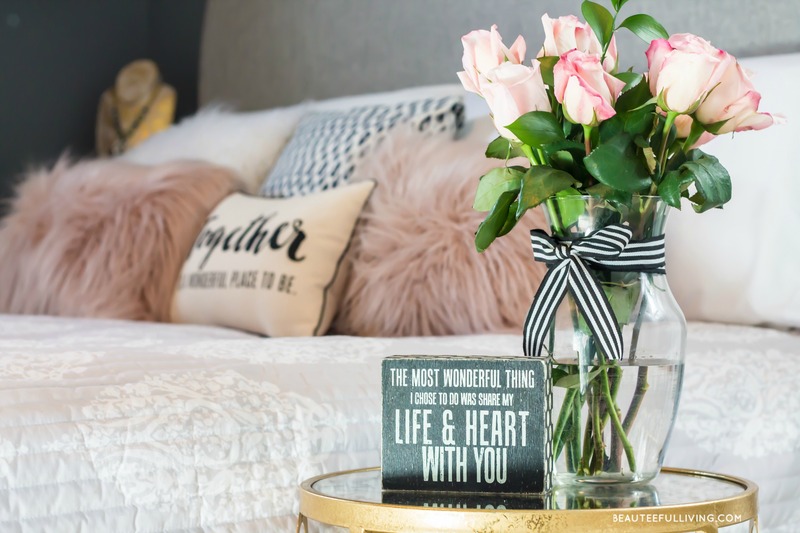 Your table really is elegant 🙂 I love how you mix in all the different prints!